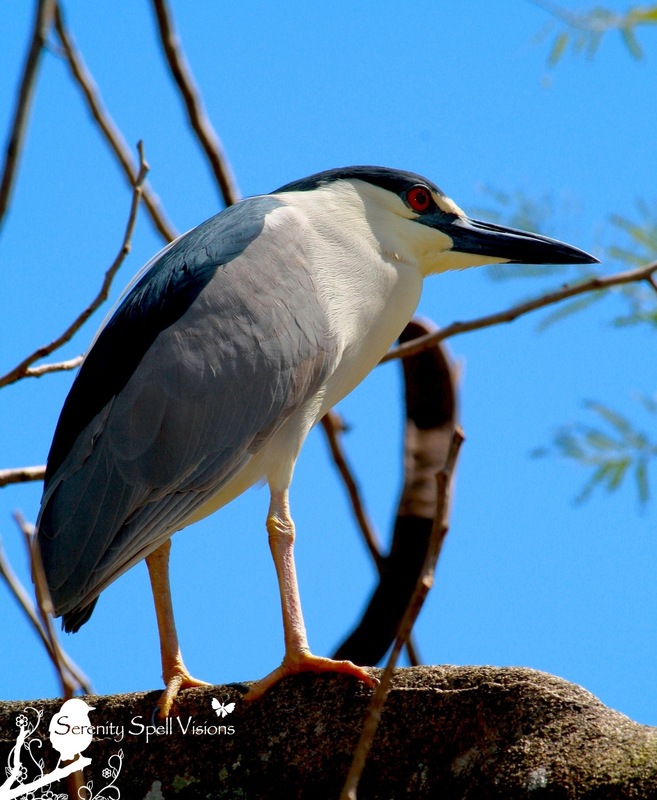 A Black-crowned Night Heron surveys his magnificent Everglades empire against an azure sky, from high in the cypress…. May your weekends be as simultaneously brilliant and serene! A lot of folks do very well with the feathers’ detail, but this is the first time I’ve seen the texture of the skin on those legs – he’s beautiful, with just slightly baggy “Knees”! Just wonderful – I always look forward to your new offerings! I was REALLY excited to get right under this guy, at such an unusual angle — very odd with these guys, at least in our area, where they tend to be very timid, sticking to the water’s edge and treelines. I was thrilled. 🙂 And a bit earlier in the day, too — offering a clearer sky. The night heron does look wonderful. The feathers look so velvety. I was so happy to sneak under him, for this odd-angle shot! Usually they’re shyly hidden by the water’s edge… This was down in Big Cypress, too. I miss it! Stunning photo of this beautiful NH! Lucky you to be in an area where you can see this tremendous wildlife! Thanks so much! I was lucky to get this unusual angle… I am always appreciative and thankful of my surroundings, this ecosystem, and its resident critters. I just wish our developers were! You were fortunate indeed that the heron let you get so close. It’s also good, as other commenters have said, that you were able to get so much texture in focus in various parts of the bird’s body. As for getting developers to appreciate the things that you do, good luck. Sigh. You’d think that they’d be shamed…. Alas. More strip malls in the place of first-growth swamp and forests, alighting next to empty, foreclosed strip malls. GREED at its worst. The dearth of efforts to stop them is pitiful. And then, to see the generations of migratory birds and other animals displaced, looking for their land? Baby steps, baby steps. Good model, good, pose, good photograph – even your logo looks good on it. Beautiful. Thanks so much! It really was a lucky, very opportunistic shot… Especially considering it was taken in the ‘glades. 🙂 The logo does work well on it, doesn’t it? So funny. What a really nice image! Y’all have some beautiful models in that little swamp. Good job! My daughter and I keep talking about it…we need to get “doing.”! You’re so incredibly kind, what a tremendous honor! Many, MANY thanks for the thoughtful nomination. Thanks so much — I really was thrilled to get this unusual angle, at such an (odd) early time in the day for these lovelies! Hahahah! DITTO. They really are amazing though, when you see them close-up…. This such an amazing photo ,it makes feel like I’m there in the Everglades admiring this little beauty for myself, seriously awesome! VERY lucky shot, such great timing on this guy…. They’re usually not out and about quite so early (being nocturnal). And they’re a bit shy, so the fact that I was able to get as close as I did was very fun. I was trying to suppress my delight, so as to not frighten the guy.